Coriander is native to parts of Southern Europe, Northern Africa and Western Asia and has been cultivated for at least 4000 years by people from many different civilizations. Slow Bolting is an open-pollinated, heirloom variety of coriander, meaning that you can save the seed from year to year and they'll grow true to type. Slow Bolting Coriander is an annual herb grown primarily for it's fresh leaves. Coriander leaves look similar to parsley and are best eaten raw or added at the end of cooking as they tend to lose their flavour with too much heat. The flavour of coriander is well suited for adding to salads, dressings, dips, noodle dishes, meat marinades, soups, stews and stir-fries. Some people have a gene that causes Coriander leaves to taste soapy or metallic, but to most people they are aromatic and fresh with a citrus-like flavour. The seeds of this variety may be collected as a spice for grinding or using whole, though they are much smaller and fewer in quantity than those produced from varieties grown for seed. Coriander loses most of its flavour when dried so for long-term storage it's best to chop and freeze the leaves with a few drops of water in ice cube trays. Coriander if left to bolt will produce masses of small, white flowers that are a favourite source of nectar for many beneficial predatory insect species including green lacewings, ladybugs, hoverflies and several types of caterpillar-parasitic wasps. The larval stage of all these insects feed on pest insect species while the adults feed on nectar and in the case of ladybugs on pest insect species as well. Choose a growing site for Coriander that receives full sun or part shade, growers in warmer climates may wish to avoid planting into full sun as too much heat stress will cause Coriander to bolt to seed. Ensure your soil is free draining, consider growing Coriander in raised beds or containers if your soil is too compacted or heavy with clay. Dig lots of organic matter including well-rotted animal manures, compost and worm castings through your garden beds a few weeks prior to sowing to improve your soil structure and provide your coriander plants with the nutrients they need to grow strong. Coriander should be grown quickly or else it may bolt to seed before it puts on much leafy growth. To encourage fast, healthy growth you can fertilise your Coriander plants every second week with an organic liquid fertiliser, worm juice or compost tea. Wet the leaves as well as the root zone for maximum uptake of nutrients. Mulch around your Coriander plants well to suppress weed growth, keep their root systems cool and retain moisture. Water your Coriander plants regularly, at least every second day, as any drought stress may cause your plants to bolt to seed. Coriander prefers growing in an acid-neutral soil pH between 6.3 and 6.8. In cooler regions of Australia sow Slow Bolting Coriander seeds from February to March or from October to November. In temperate regions of Australia sow Slow Bolting Coriander seeds from March to April or from September to November. In subtropical regions of Australia sow Slow Bolting Coriander seeds from May to June or August to September. In tropical regions of Australia sow Slow Bolting Coriander seeds during the dry season from April to July. Sow seeds directly in the garden where they are to grow as Coriander can be prone to bolting if transplanted. Sow Coriander seeds 6mm deep. Water every day until the seedlings emerge as the seeds will die if allowed to dry out. Thin seedlings to about 20cm apart to give them plenty of room to grow. 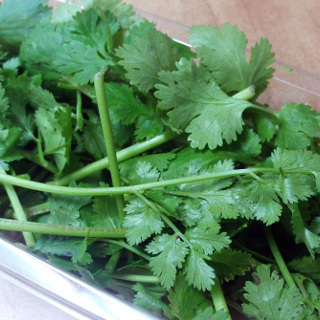 Sow a few seeds every week during the growing season to ensure a continuous supply of delicious Coriander leaves. Coriander seedlings take between 12 and 20 days to emerge once the seeds have been sown. Slow Bolting Coriander is fast growing, reaching a size large enough to harvest 6 to 7 weeks after sowing the seeds.